It’s 10:30 on a clear mid-December morning with the outside temperature in the teens above zero. I’m in the base lodge with my ski boots off sitting with my feet propped up as close to the blazing fire place as possible. I can feel a tingling in the toes on my left foot which is a good sign that the blood is beginning to flow again. The tingling will be followed by a pulsing, throbbing pain as circulation is restored to the foot. The final phase will be a flush of warmth throughout the foot which could be described as a burning sensation, but it is actually a relief from the cold numbness and previous pain! I’m in the process of breaking in a new pair of leather ski boots. This means I’ll put my boots back on, go out for 2-3 runs, or until the cold numbs my feet again, and then repeat the warming process. “Leather ski boot” is an oxymoron – a combination of opposites. Ski boots need to be laterally rigid for proper edge control and the forward flex should be stiff so that forward force is transmitted to the front, turning portion of the ski. “Rigid” and “stiff” are not words typically associated with leather. Leather becomes soft and pliable with repeated use. 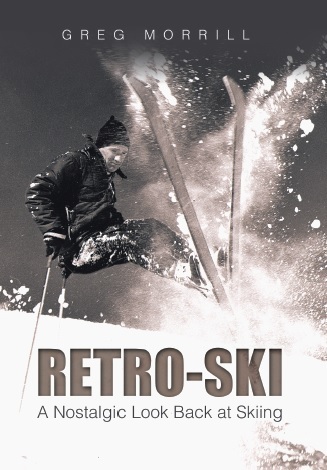 In other words the attributes we need in a ski boot degrade over time with leather. So let’s look at the phases in a leather ski boot’s life. Wait a minute. Aren’t those the phases for any ski boot? Well, yes, but today the Comfort Phase and the Adjustment Phase can be measured in years while for leather boots they were measured in days! The Fitting Phase: A leather ski boot needed to be uncomfortably tight in the shop, some would say painfully tight. If the boot was comfortable in the shop, then it would be too loose when broken-in. The Break-in Phase: The break-in period for a pair of leather boots varied and each person developed his/her own approach. Some wore their boots around the house for gradually increasing intervals. Some filled their boots with hot water, let them sit for a half hour, then emptied them and wore them around for a half hour. Others like me used the early ski season. It took me about 7-10 ski days to break in my boots. As described in my intro, the break-in was a painful period! The Comfort Phase: Once broken-in, the boot could be skied with minimal or no pain. On warm days you could ski all day in your boots! Cold days still required warming visits to the lodge since leather got its support from tightness which leads to cold feet! For leather boots this phase lasted 2 days – well, maybe longer if you had some really good boots. The Adjustment Phase: As leather boots softened, adjustments were required to achieve support. During the ski day you would have to re-lace your boots to make them tighter or re-wrap your long thong (we’ll discuss those in a later article). The length of this phase depended as much on your budget as it did the boot condition! By the way, if you went directly from the Break-in Phase to the Adjustment phase, then your boots hadn’t really fit you in the first place! The dream leather boot for my circle of friends was the Molitor or Moli (pronounced Molly) for short. Karl “Moli” Molitor was a successful Swiss ski racer from Wengen, Switzerland. 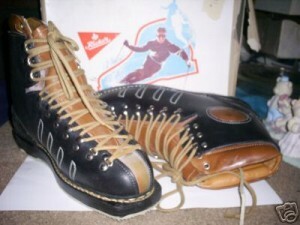 He designed the boots based on what he felt skiers needed and had them hand-made to his specifications. The boots were known for their performance without involving the pain many of us associated with leather boots. Molitor boots were more expensive than other boots so some of us could only envy those who could afford them. In the 1950’s a pair cost $49.50 while a good pair of wooden skis with bindings went for $24.00. To put it in perspective, that would be like a pair of $2000 boots today! Karl Molitor is now 90 years old and his family still runs a full service ski shop in Wengen (www.molitor.ch). Willie White from Waterbury was last week’s winner correctly identifying “moli” as the affectionate name for Molitor ski boots.